High capacity bariatric scale ~ It even talks! Platform Size 14.7" x 11.25"
Scale Size 14.7" x 12.5" x 1.6"
It Talks! Only If Ya Want If you, or a friend, have less than perfect eyesight, the XL-550 talking bathroom scale is for you. When you weigh with this scale, your weight readings will be said aloud in a pleasant, easy to hear female voice. If you're not in the mood to have your weights announced, just flip the switch on the bottom of the scale to make it hush up. Easy To Read Weight Display A lot of the bathroom scales ya see around have a teeny tiny weight display. Now, that's fine for most people, but not if ya have trouble seeing that tiny stuff. My Weigh designed this digital bathroom scale with a great big, LCD weight display with digits nearly one and a half inches tall. This feature is great for users with not-so-great vision. It Won't Scuff Up Your Floor Don't you worry about the XL550 scuffing up your pretty bathroom floor. The XL has scuff resistant foot pads to keep your floor safe, and to keep your scale from sliding around. Step And Weigh Feature You won't have to bother bending down to switch this bathroom scale on...just give it a quick tap it with your foot. The scale will turn on and you can get to weighing. Pretty easy, huh? Scale came in on time as promised works great ... However the face plate over the lcd number showing weight was not attached. I had to reattached is that normal? I got this scale from this site about 5 years ago and it is still holding up and still accurate! I love the scales I ordered. They are exactly what the description they said they were. I was worried about them weighing me, but, I didn't have any problems with the scales. It was an excellent purchase. I would advise anybody looking for good scales, to use you company because you all are awesome. Thank-you for the sevice. My wife has a problem with her stomach and I had to find a way to get her weighed other than going to Weight Watchers or somewhere outside our place. We found this scale on the internet and decided to purchase it. It is an outstanding scale, very easy to use and easy to store. My wife likes it because she does not have to travel somewhere to find out how much she weighs. Convenience is key here because she cannot stand for a long period of time and wait to find out her weight. 5 stars from my wife and I. The product is what we need. I recommend this site! This is a great quality product. Big enough platform to stand on and the voice is clear and easy to understand. Thank you! Excellent scale for the price. Stable base. Sufficient volume. I'm a big 400 lb guy with a size 12 EEEE shoe. Perfect. This scale is perfect. The only thing is o wish the platform was a little wider and that there is a voice volume button. It's gives me the correct weight everytime. Just what it's suppose to do! I haven't had a scale in my home for many many years. I was worried that this would be a flimsily made scale but it is sturdy and I love it. It's also wide enough and comfortable to stand on. I am very happy with this purchase. Works well, and reads the same after stepping off and on again.very polite speech wise. Very good price for the product. This scale works well. You can hear your weight, without looking down. Great Price. I treat people for nutrition therapy and weight loss. Most of the time the scale we use weighs up to 400 lbs. and that's adequate. However recently we did an intake for a 6'10" fellow who we could not weigh on that scale. We ordered the XL-550 and it was delivered in just a few days. It works fine but I haven't figured out how to stop the scale from talking when weighing a patient. I would recommend your company and this product to anyone needing a scale for the obese person. have looked at many scales for obese persons with much disappointment. Came across your page and can only say, economical, sturdy, quickly delivered and functions well. Could not be more pleased. This is the second XL-550 I have purchased from Old Will Knott Scales. I bought this set of scales for my wife when hers (not an XL-550) started giving her trouble. It took her a couple minutes to realize how to use it, i.e. step on, step off, then wait until it says "Its ready" to step on and weigh yourself. She did not want to read the instructions. As I mentioned, these scales talk to you, which is good if your belly gets in the way (my problem). If you do not want the rest of the room to hear what you weigh, there is a mute switch on the bottom. I have owned the XL-550 for years with absolutely zero problems, I highly recommend it. 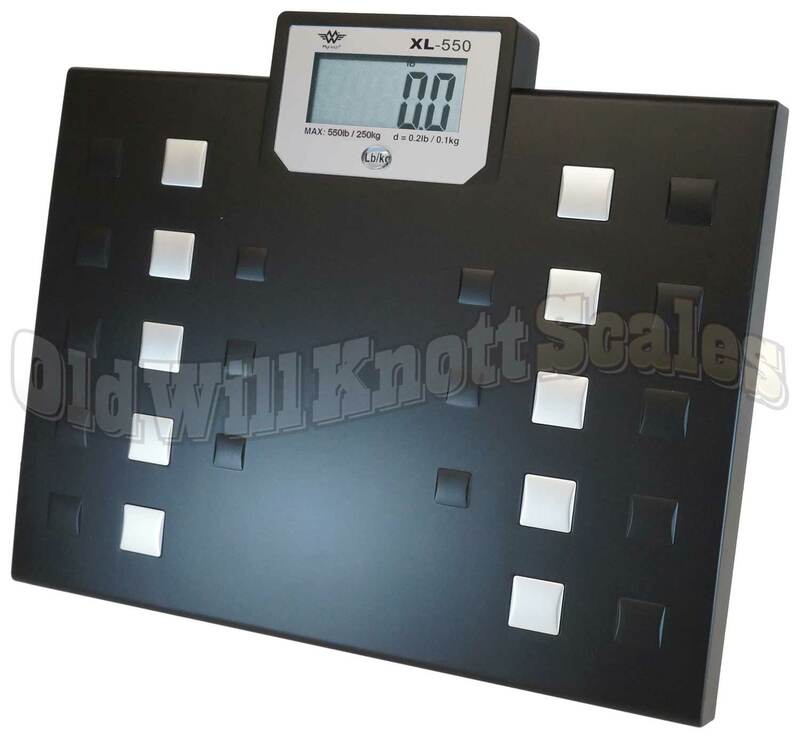 I like doing business with Old Will Knott Scales when buying scales, because scales are their only business. The only scales I have purchased have been the XL-550, however the rest of their products appear to be quality products also. The product is great, but the service you provide and the ease and speed with which the order was received was great. i have and then gave for Christmas a talking scale. I would use Will Knott again and again! I love this scale it is very accurate to the doctors scale, and is very durable. We really love this scale. It's fairly lightweight considering some I've seen. It's easy to use, accurate and it even comes with batteries. You won't be sorry for this purchase. I will buy from this company again. Was so excited to get this scale and was not disappointed! Accurate reading and love that I can shut off the talking. Received it quickly with standard delivery. Great customer service! They even check on u to make sure you are satisfied with your order. This company has been awesome in providing a scale for one of my clients and did it so very quickly and it was so very appreciated. I will use this company next time I need to purchase a scale! Scale works as advertised (which is a rare thing in this day and age) and I am totally satisfied !!! I have had a lot of regular store bought scales die on me, so I decided to buy a sturdier scale with good reviews. This one arrived quickly and was super easy to set up (literally just take it out of the box and go). It talks to you, which is cute. The accuracy of the weight was a consideration of mine, because I joined weight watchers recently as part of this endeavor and wanted a scale that would be accurate to what I would be weighing in on that program, and it was 100% accurate. I am very pleased and would recommend this site and this scale to anyone looking for a quality product from a great retailer. The customer service here has also been fantastic. I HAVE HAD MY SCALE FOR A COUPLE OF MONTHS AND LOVED IT. ALL OF A SUDDEN 5 'F'S" APPEARED IN THE WINDOW (ALONG WITH TWO BEEPS). WARRANTEE CARD SAYS THAT 4 "F'S" APPEAR IF OVERLOADED. I WEIGH 150 SO I DON'T THINK THAT IS THE CASE. CHHANGING BATTERIES HAS NOT HELPED. HELP! I have had my scale for approx. 2 weeks. The scale came as promised and was exactly shown in the pictures. I love my scale and plan on using it daily. Works great would recommend it to anyone. I like it talks to me I don't have to try to look down. The wide base makes it easy to step on and off. Well worth the money. I bought this for my son and he loves it. He says it gets 5 stars! I am so happy with this scale, it is everything I wanted. It is being used on a daily basis by the entire family, the display is large enough I don't need my glasses to read it, we haven't used the voice activation feature yet but will eventually get around to it. The scale is light weight to move around but is heavy duty enough to hold all the weight put on it. I highly recommend it. It does everything it says very easy to use, and have not one problem with it. It is so easy to use and convenient I'm surprised it doesn't tell me my weight when I just walk by it. Maybe I am so happy with it cause my weight loss is going good and it tells me what I want to hear I don't know. LOL I'm just very pleased with the the customer service as well. I LOVE MY NEW SCALE!!! !THE NUMBERS ARE SO EASY TO READ AND IT SPEAKS YOUR WEIGHT AS WELL. BEST INVESTMENT IN A SCALE EVER!!!...P.S. MY GRANDKIDS LOVE IT TOO!!!!! This is a great scale. My wife and I are very happy with it. We love the talking feature. We don't have to look down to see the weight, it just tells us. Great value, great product !!!! I ordered this scale to use in a weight loss challenge at my place of employment. We do have some employees that are on the heavier side so I had to make sure the scale was not only portable but had a heavier capacity. The wide platform, large pound capacity, and performance are exactally what we needed. I am very please with my purchase! I have found this scale easy to use and accurate. The talking feature makes it a pleasure to use, especially for someone of my size. There is a delay from the time one touches the scale until it says "hello" , then a delay until it says "ready" , and a long delay until it reads out the weight - but it is accurate. I found purchasing from Old Will Knot to be effortless, with good feedback from the company on the purchase, well packed and prompt delivery. A good company to do business with. This is the best scale we have ever bought. My husband is very satisfied with the talking function. Our grandchildren love it. YOUR COMPANY MADE THIS ITEM SO EASY TO ORDER. If the scale does not work at first replace the batteries and away you go!!!!!!!!!! Will pass this wonderfull information on to all I know. Great scale that talks and is accurate! I needed a stronger scale to weigh both me and my great dane as long as I could carry him. Both of us on this scale totaling 280 lbs! The danes's weight of 118 was the same at the vet's office! Very happy with the scale! So far so good! We've had the scale 2-3 weeks and it works great! Absolutely no complaints at this time, and it seems to be a great scale for the price. I just wish it had a button to switch from "reality weight" to "delusional weight" , but ya can't have everything, I guess. I got this not knowing my actual weight. It works great, and the bad news isn't as bad as I thought, so that's good news, right? Now I can keep track of my weight again! I had a hard time finding a place to weigh me as I am over 440 lbs. I finaly broke down and bought this scale and it is a game changer. I can step on it every morning and get my exact weight with ease. Fantastic product. I recomend it highly to anyone out there. I bought this scale so I could have an accurate weight at home, and so many scales do not go up high enough or have the accuracy that exists on this scale. The platform is wide enough to do an accurate weight. I don't have the talking feature enabled. The only thing I would change in this design is the display. It would be better if the numbers were just a bit bigger and bolder and contrasted against a lighter background. However, I can read the numbers OK in typical bathroom light. This scale is also accurate at the low end. I have weighed my new cat over the past year and watched him grow from under 5 pounds to 9.8 pounds, then 10 pounds so far. I am pleased to see it accurate on both ends of the weight spectrum. This scale has become my best friend because I am on the new Shaklee180 Turnaround program and so far have lost 35 pounds in just 5 weeks!!! Purchased this for Christmas...anticipating making changes in 2013. 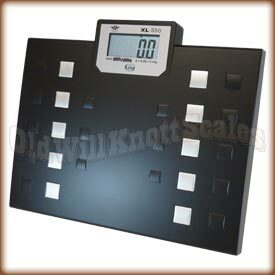 Scale looks great, works great, and Old Will Knott was a great company to work with! I was a little concerned about ordering on line, and trying to find something in my price range, but I was pleased with the response, follow through and follow up by Old Will Knott, and am generally pleased with the product. Hopefully this scale will provide many years of service. The XL550 is an excellent buy!Great product,accurate too.I am so happy to have found this wonderful scale. i fell in love with my talking scale ever since i unpacked it i was surprised to see that it was very light weight it is easy to understand and it cuts it self off not to waste any of it battery power my best purchase this year. My mom is almost 90, almost blind and almost deaf. She has a hard time. Her doctor asked her to monitor her weight due to congestive heart failure and fluid build up. I bought the talking scale in bopes that she would be able to do what the doctor asked. What a success! She can hear and underswtand the voice and loves the fact that she can monitor her weight herself. Home health care is very supportive of her ability to follow through. Thanks so much. This is the third time I have purchased this scale at friends request, for them. Once they saw and used mine, they had to have their own. Can't see how I could give you a better endorsement. Great product, easy to use, very accurate. The BEST customer service I have received in a long time, keep up the good work!! !